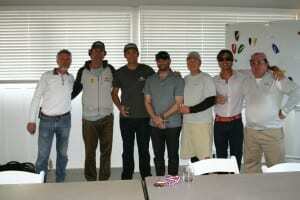 April 14, 2015, Dave Perry with a team comprised of local sailor Jon Singsen, New York Times Correspondent Chris Museler, and Californians Doug McLean and Steve Natvig went undefeated in the first qualifier of the year: A difficult feat given the level of competition in this qualifier with half of the top 10 in the country competing. In addition, several of the teams had top 25 skippers sailing as part of the crew this week and Peter Wickwire was previously ranked 30th in the world, before taking a short hiatus to be with his young family. Team Perry earned a spot at the U.S. 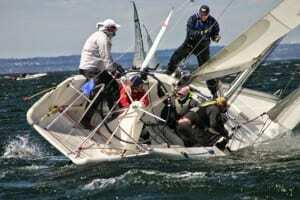 Match Racing Championships that will be held at Oakcliff October 10-12, 2015. Saturday saw heavy air racing with steady winds in the low twenties and gusts into the high twenties in the middle of the day requiring the RC to fly the no spinnaker flag for 5 flights. Sunday was the antithesis with light fluky winds. PRO Todd Field and a very talented team was able to get as much sailing as possible out of the conditions to complete the format. Second place went to Canadian sailor Peter Wickwire sailing with regular crew Hamish and Ali Mathews, Jim Barnash and the oldest foredeck crew of the regatta Terry Shannon. Other than their losses to Dave Perry’s team their only other loss was to Doug Shannon. The winner of the petit finals was David Storrs sailing with USone (2013 World Match Racing Champions) team members Rod Dawson tactician, Hayden Goodrick, Mal Parker and Ricky McGarvie. New this year, the qualifier system has removed the geographical areas so any match racer can request an invitation to any of the 6 qualifiers still to be held at St. Francis YC (May 23-24) and (Sept. 5-6), CMRC (May 30-31), San Diego YC ( June 13-14), Annapolis YC (June 20-21) and Bayview YC (June 27-28). Female skippers can qualify for the USWMRC at most of these qualifiers. Details can be found at http://www.ussailing.org/racing/championships/adult/matchracing/.